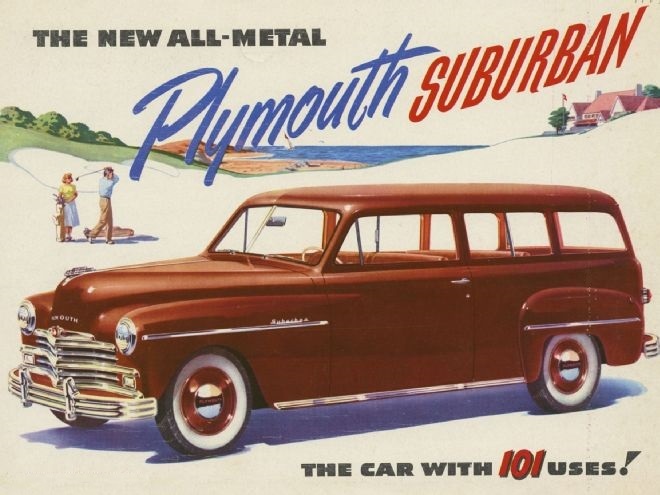 CControversial Question: Who Made The First All-Steel Station Wagon? A recent re-run of Paul’s article on the 1946 Willys Jeep Station Wagon prompted this question in me, which I thought I should share with the wider CCommunity. The very definition of the station wagon may be hard to pin down (I will propose mine, but it’s not necessarily yours), but I’m not sure the Peugeot 402 pictured above would agree to a claim by Willys or Plymouth as “the first all-steel wagon”. Just because all American wagons up to that point were woodies doesn’t mean the 1946 Willys Jeep Station Wagon or the 1949 Plymouth Suburban were global trailblazers – they were American trailblazers, which isn’t quite the same thing. There were quite a few all-steel wagons before these two, just not in the US. First, let’s try and be clear on the terms we use: a station wagon (a.k.a an estate in British English, a break in French, a combi in German and a giardinetta or giardiniera in Italian) is a vehicle derived from a standard saloon (same front end and doors) and not from a truck chassis, like the Chevrolet Suburban. Wagons have a long roof and a large rear opening – usually, in the early days, a two-piece tailgate – and may have rear passenger doors (a four-door wagon) or not (two-door wagon). All doors have windows and there is an additional window aft of the C pillar. There may be two or three rows of seats for a minimum of four passengers. Note that if we use this definition, the Jeep doesn’t really cut it as a wagon – it is not derived from a standard saloon – but let’s let that one slide for the time being. The tailgate is the key thing here. Without that, all you have is a family car or a limousine. And without the rear seats or the rear windows, what you get is a delivery / commercial car or panel van (there are many names for those). I will also state here that I’ll focus on what I know best (French cars), but that there may have been other carmakers with similar models in Germany, Italy, Britain and Czechoslovakia. And, just to reiterate, we’re looking for all-steel bodies, not coachbuilt specials or one-off bitzas that never made it to the market. So let’s start with the obvious: Citroën. What we have here is a 1938 Citroën 11C Commerciale. It is not only made entirely of steel, but also FWD and monocoque. 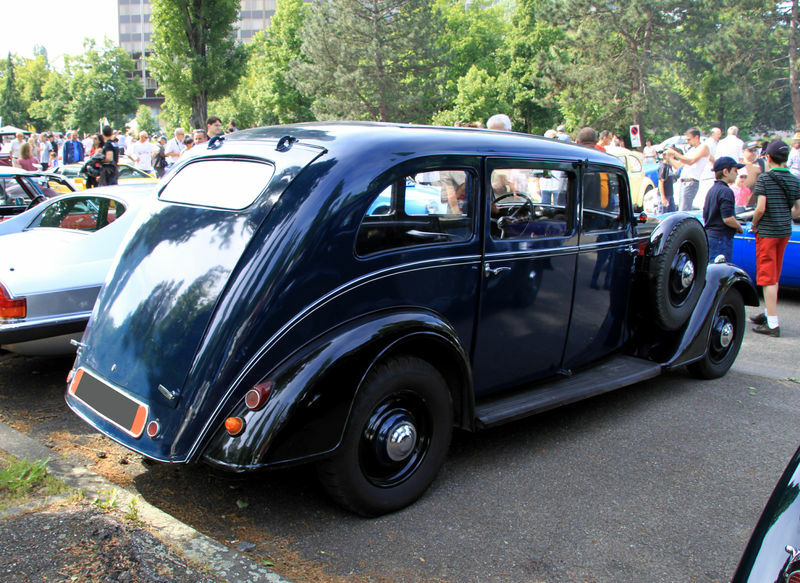 The Commerciale was developed from the long wheelbase 11A Traction Avant model that debuted in 1934 as the “Limousine” or “Familiale”, the main difference being the rear opening, which was absent on these and became a two-door hatch on the 11C. The car came with a rear seat, which had to be unbolted and taken out to make full use of the cargo space. One car for every day of the week: for work on (grey) weekdays, for the family on (golden) Sundays. Around 3500 units were made when the war stopped LWB monocoque production, which only resumed in 1954. By that time, the model was reengineered with a one-piece hatch hinged on the roof – a pretty interesting feature to premiere on a 20-year-old design. But Citroën had been making all-steel cars since 1924. Were there any RWD Citroëns that might qualify as wagons? The FWD 11C’s immediate predecessor, the RWD 11UA, was available in this configuration. Heck, the 11UA even has a strong claim to being one of the first Diesel cars ever sold to the wider public, let alone the all-steel wagon. But let’s keep to our subject matter. Before the 11UA, which was made from 1935 to 1938, there was the nearly identical Rosalie in 1933-34. 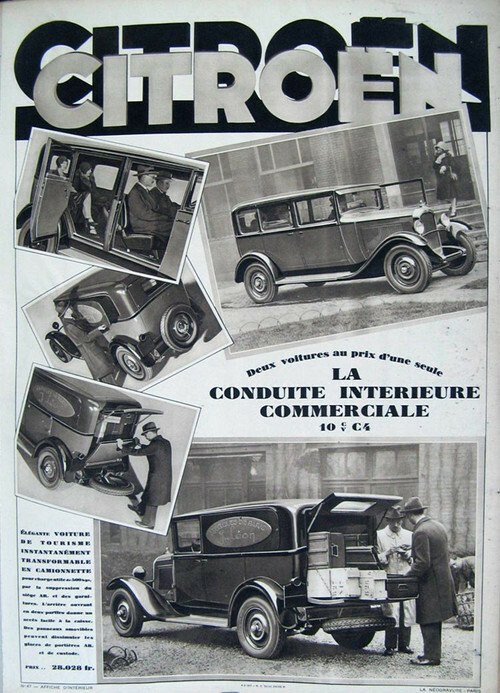 And before that, all the way back in 1928, there was the C4, which also had a Commerciale variant. These were sold specifically as “transformable” cars: the seats popped out, a metal plate could cover the rear windows and Bob’s your uncle, you had a delivery van. Versatility was the main selling point, as we can see from this 1930 advert. Lest you think that the weirdos at Citroën were alone in making these, let’s take a gander at other carmakers. Renault made these too on their largest pre-war 4-cyl. chassis, the Vivaquatre. What is not clear to me as yet is whether these still had wood-framed bodies. 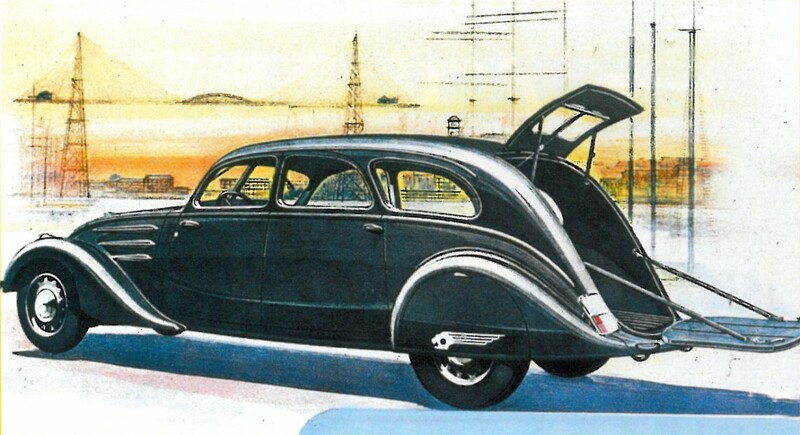 The early ‘30s Vivaquatres, which were ubiquitous in Paris as taxis until the late ‘50s, certainly still had wooden frames, but the 1939 cars, I’m not so sure. So let’s count that one as a maybe. But by the late ’30s, Renault had taken the plunge and gone all-steel monocoque on their new small car, the Juvaquatre. 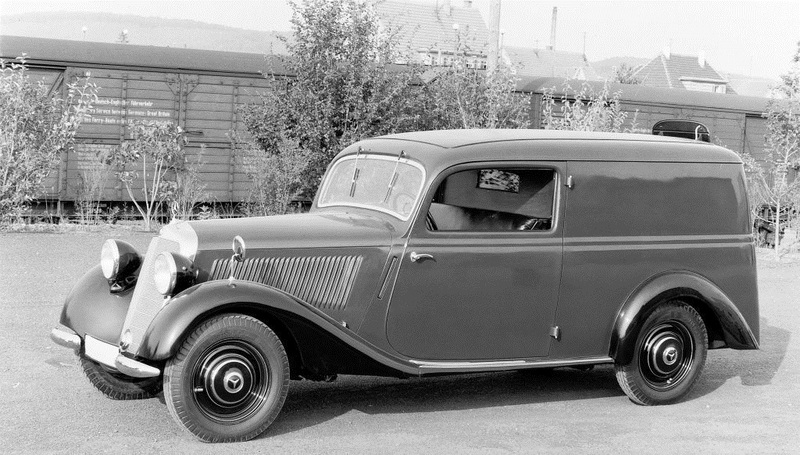 Renault planned to launch a two-door all-steel Juvaquatre wagon by 1940 or 1941 – the war killed it, though it seems a few prototypes were made and even sold (at least one survived). The Juvaquatre “Break” only came out after the war, initially made by aftermarket specialists out of the panel van that Renault started making in 1945. Renault produced their own station wagon version by 1949. The rear seats could be folded to increase cargo space, but the Juvaquatre Break’s main clientele were folks who wanted cheap wheels with a maximum amount of passenger and/or cargo space. Professionals who wanted the panel van usually preferred to get that rather than the Break. 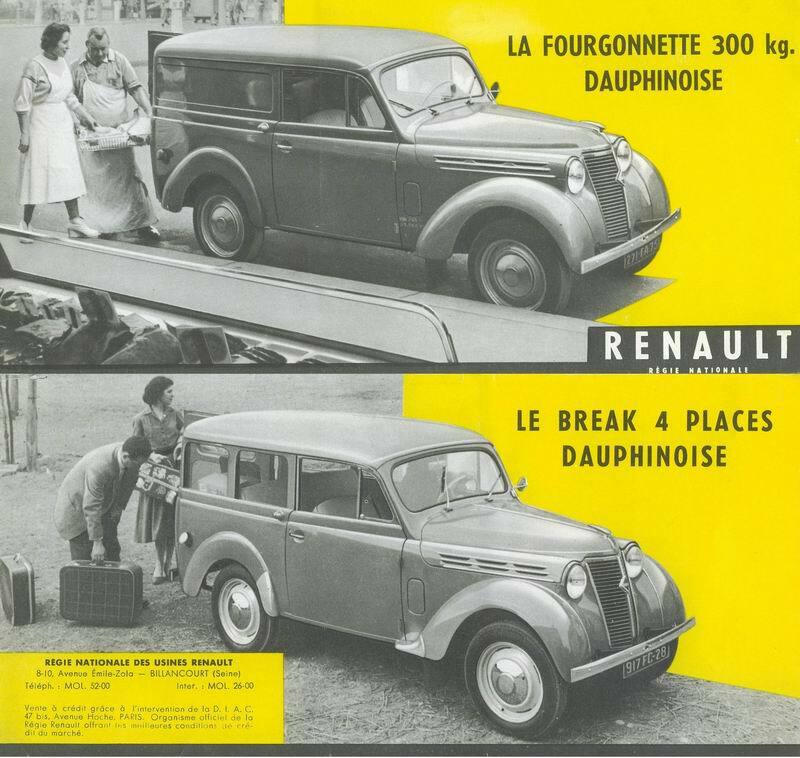 The car was a much bigger hit as a wagon than it ever was as a saloon: the latter was nixed in 1949, while the van and wagon versions soldiered on until 1960, eventually being renamed Dauphinoise and given the Dauphine’s engine. What about the King of the Wagon, Peugeot? Surely the well-documented string of wagons they made post-war was not born ex nihilo? Peugeot usually called these cars “Limousine Commerciale” back in the day, and always made them on a longer wheelbase than the normal saloons they were based on. 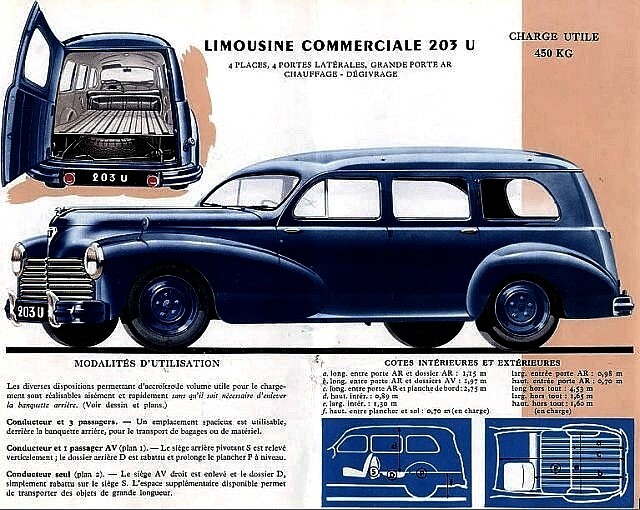 The 203 U Limousine Commerciale came out months after the saloon in early 1949 (same time as the Plymouth), soon followed by a deluxe family model. 1939 Peugeot 202 U Limousine Commerciale – the first compact wagon? 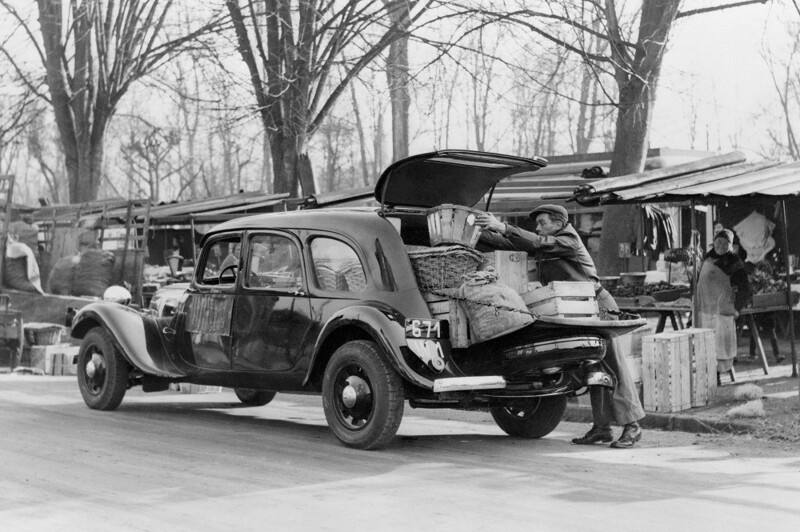 When Peugeot launched the smaller 202, that model also had its all-steel wagon variant, the 202 U Limousine Commerciale, introduced in 1939. That one was made in relatively small quantities (just over 900), as wagon production was stopped by the fall of that year. 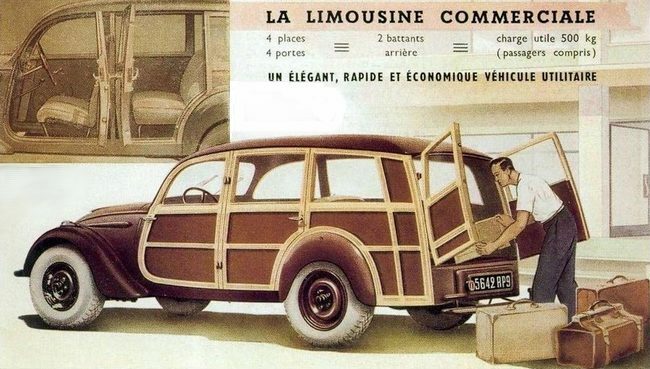 Post-war, Peugeot’s 202 UH Limousine Commerciale went back to timber – wood you believe it? When Peugeot resumed the 202 as its only car model in 1945, the Limousine Commerciale’s all-steel body was replaced by wood, which of course was not rationed at the time. The 203, Peugeot’s first unibody, was launched in 1948 and begat a long succession of saloon/wagon models that remains unbroken almost 70 years later. 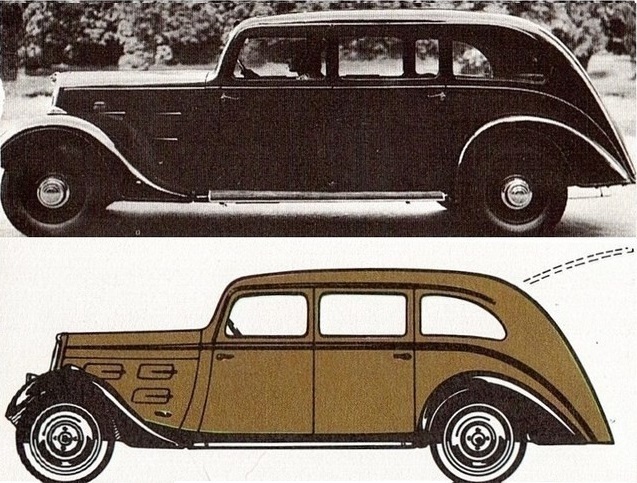 What happened after the war for the French “Big Trois” carmakers is that they deleted one model from their range: the five-seater limousine. Long wheelbase 4-cyl. cars were no longer glitzy enough to box in that category. But as family cars and/or light utilty vehicles (i.e. as station wagons), they were right on target. The Standard Vanguard estate came out in September 1948 – about six months before the Suburban. I’ll stop there because it’s getting really late and it’s likely that most of the other ’30s French carmakers who made these proto-wagons (Chenard-Walcker, Licorne, Berliet, etc.) still used wood-framed bodies. But who’s to say that (for example) Hillman, Adler, Škoda or Volvo didn’t make all-steel wagons before 1946? I’ll let the CCommentariat provide us with a lively discussion about this particular point. 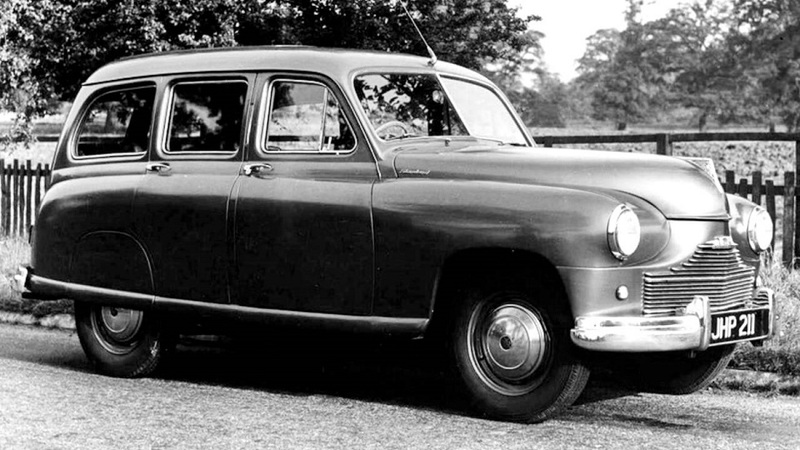 Suffice to say that the Brits could point to the 1948 Austin A40 Countryman or the Standard Vanguard Estate as their own first “true” all-steel wagon, given that the Jeep never was a saloon to start off with. And what about the Italians, who claim that the 1948 Fiat 500 B Giardiniera Belvedere is the first series-produced station wagon (though a woody)? Ladies and gentlemen, the floor is yours. A whole lot of cars that I’ve never heard of before. Absolutely fascinating. And pretty obvious that the Americans were late to the all-steel wagon game. As to the Jeep – given that Willys only did a post war “real car” (the Aero – while didn’t do well) for a couple of years in the early 50’s, I’ve always considered the Jeep as their car from the day the civilian model was introduced. Um, a tiny typo in the article. Germans spell it as Kombi with capital K.
Otherwise, great article! With Internet access, lot of automotive history is constantly revised as people post the earlier examples or trace further back to the original or first example. Sometimes we have to redefine or recategorise what is assumed to be so. For instance, Mini was once considered to be first production FWD car with transverse-mounted motor and gearbox, but digging further in the Internet and contributors proved otherwise. I recalled bringing up a 1935 Chevrolet Suburban as an earlier example of all-steel estate in the same article that Paul wrote. Yet, one might say: ‘oh, Suburban is based on truck chassis so it doesn’t qualify as an estate.’ Other might say, ‘what about those estates with body on frame?’ Maddening, isn’t it? There was a Dodge model too, that like some of the French models came with removable panels and was intended as a combination business/family car (unlike the Suburban which was advertised as a small bus). But it too was built on the half-ton truck chassis. Hard to tell without a picture comparison since the light trucks basically used the 1933 car front sheetmetal. 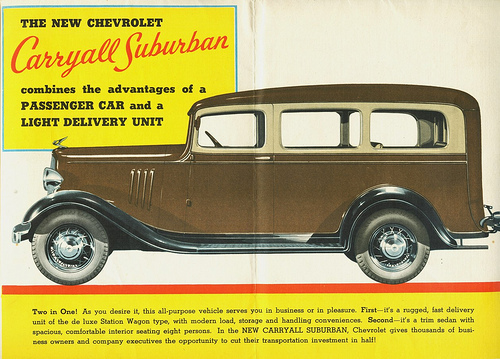 Actually the 1935 Suburban was advertised as a combination of passenger car (trim sedan”) and light delivery unit. Which means it is very much in the same idiom as almost every one of these European “station wagons”, which were mostly all commercial vehicles and had heavier/different chassis/suspensions than their sedan counterparts. It’s important to remember that in the US before WW2, station wagons were not really common as a family car. They were primarily targeted to commercial users, as they were the small passenger van of their times. That’s where the name “station wagon” comes from: a vehicle used by hotels to ferry guests to and from the train station. They were considerably more expensive than sedans, and just not considered “cool” or stylish or economic for a personal car. But right after the war, there was a huge change in the target market of wagons: the family. Folks were eager for a vehicle that would encompass their many interests and hobbies, like camping and fishing, and Americans were suddenly more relaxed about driving what was essentially a family-oriented utility vehicle. That’s the pivotal role the Jeep Station Wagon played, as well as the ’49 Plymouth and others. These were the SUVs of their time, able to accommodate a variety of functions. And they were now cool, or stylish. And they sold well. In Europe, the concept of a family station wagon did not appear until decades later. Most of the vehicles in this article were commercial vehicles. Even after the war, it would be a long time until wagons were accepted as stylish familly/personal transport. Wagons were seen as the domain of plumbers, electricians and other small contractors, who could also use them on weekends to haul the family on an outing. So the 1935 Suburban was very much a station wagon as it was commonly defined in 1935. And as such, is the first steel US station wagon. But the Jeep helped redefine the term in the immediate post war era. The Chevy Suburban had a truck chassis. Other American station wagons at the time (car-based ones) were woodies with canvas roofs. The Citroens and Peugeots featured in the post were derived from standard saloon cars and had steel bodies. They were not luxurious for sure, but then neither were the Plymouth Suburbans or Jeeps. The Peugeots used the LWB chassis of the limousine variants with larger springs, though the 202 rode on a normal-sized chassis. RWD Peugeot wagons up to the 505 Break (at least) always had that feature of a longer wheelbase and beefed-up rear suspension – does that disqualify them from being station wagons? The RWD Citroen wagons did not have a different suspension compared to the saloon. The 11C had the same LWB monocoque and suspension whether it had the rear hatch or not. 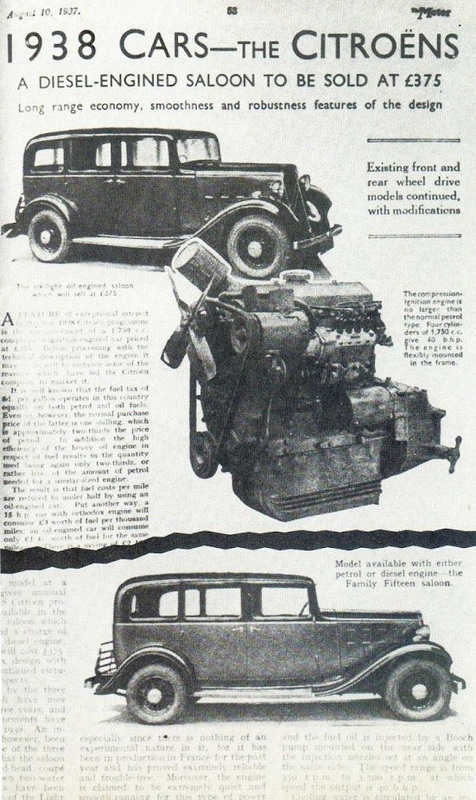 If you look at the 1930 Citroen C4 advert, it’s pretty clear these were not sold as “strictly commercial” vehicles. Their versatility as both a commercial and a family hauler was their strong point. Tax plays a part in this too: the French taxed these cars as normal vehicles, because they were sold with rear seats. if you bought a panel van without rear seats, your vehicle tax was much lower. Almost all of these were four-door wagons. A true commercial car is more usually a two-door. Like the Jeep and the Plymouth, strangely enough… Wagons gained popularity/acceptability in Europe perhaps a little later that in the US, but they were definitely there at the same time. That Standard Vanguard estate was not a cheap car for the toiling masses. 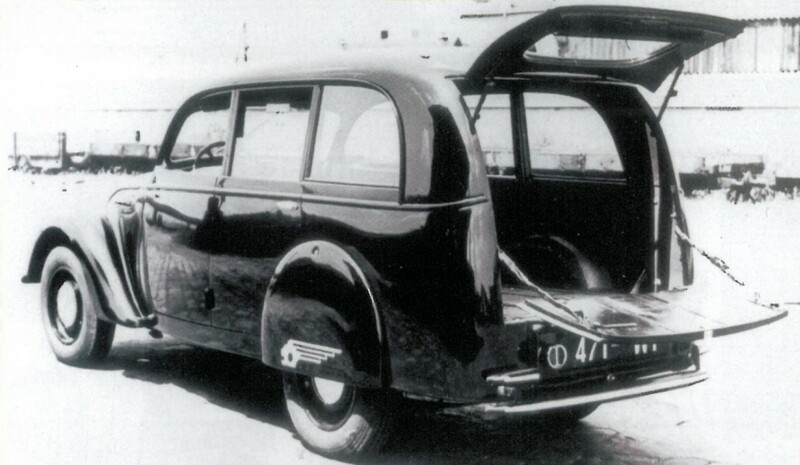 Nor was the Peugeot 203 limousine familiale, which came out in late 1949. Those had just as much trim and creature comforts as their saloon equivalent. Aside from the marques mentioned in the post, Borgward, DKW, Goliath, Opel, Škoda, Simca, Rosengart, Hillman, Fiat and probably others had at least one wagon in their line-up before 1955. The 1950 Renault Prairie and Rosengart Vivor, as well as the 1953 Volvo Duett, were even stand-alone wagons with no saloon equivalent. So wagons were not a specialty item any longer by that point in time. The main difference was in disposable income: Europeans had less money to spend on cars, and wagons in Europe, just as in the US, were always more expensive than the saloons. Got it. Thanks for detailled explanation, Paul! Thanks Tatra for this wonderful article. I think the main difference between early European saloon-based steel station wagons and the American counterparts is just perception. I agree with Tatra that these were all “real” station wagons, and I agree with Paul that they became “fashionable” for any family (not just the plumber, electrician, etc.) in the US. And that happened much later in Europe. In my opinion, if we analyze the “steel”, all the European wagons showed in the article qualify as such. And all of them had the characteristics needed for that “pivotal role” mentioned by Paul. But they just were in the “wrong” side of the Atantic, under different circumstances. Sixth photo down – they considered Samedi as a working day? I wonder when it joined Dimanche as a weekend day. What would you consider the last American Station Wagon? Dodge Magnum? I call the 2007 Ford Focus the last American wagon that didn’t pretend to be an off-roader, and was aimed at the utility-seeking mass market rather than a “car-guy” special like the Magnum or Cadillac CTS wagon. With Chrysler down to just two models now, I think that a real wagon based on the 300 might fill a need that no one else is filling now. 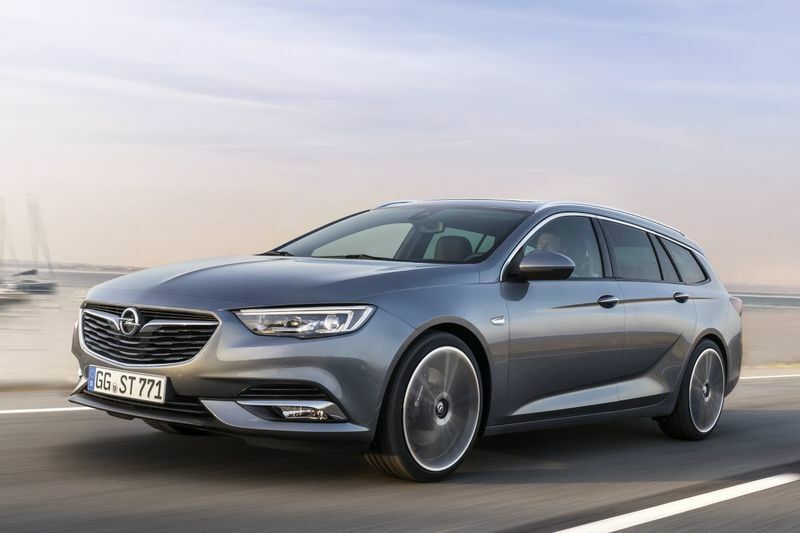 Hasn’t Buick just launched a new wagon? Looks like Chrysler missed that opportunity. You mean this one, based on the Peugeot Insignia? Saturday was always a workday for folks who didn’t work in the public sector. And even then, that wasn’t always the case. When I was a kid in the French public primary schools, we had class on Saturday mornings. This has only started to change in the last ten years or so. The very fact that the word for “weekend” in French is “week-end” tells you that it’s not a concept that’s been around for very long. As to the “last (latest?) American station wagon” question, I’m gonna say Cadillac CTS Sport wagon and run away very quickly before someone throws something at me. I think modern France has slimmed the working week down from Tuesday to Thursday. That could just be my prejudice/jealousy of course! I grew up in Austria with folks working and kids going to school on Saturday until 1PM Saturday. That’s when the weekend began. If you go back in time some, Saturday was a working day in the US too. Wow, that’s really interesting rather than controversial. But I guess CControversial works better in a title than Cinteresting. Particularly that 1938 Citroën 11C, that is one loooonnnngg car. I looked up some side view photos and it’s almost comical. I imagine that with FWD and that long wheelbase the driver would have to be careful in prewar French town streets. Very interesting article though, lots of well researched info that once again introduces me to something new. And f course there can never be enough French cars or French car history! Proof once again (as if any of us really needed it) that “the beginning” of something usually turns out to be a muddy swamp rather than a well marked trail. Some really interesting stuff here, all of which is completely new to me. great article Tatra87, as ever. I’d contend, in British English, that an Estate Car, (Shooting) Break and Station Wagon were (potentially) three different albeit overlapping things. Or at least they were. Shouldn’ t that be “shooting BRAKE”? Ahhh no brake is what happens when you press the middle pedal, for the body variation its break as in I need a weekend break lets take the Peugeot 405 break. Sorry but it’s definitely shooting brake. The French work is related, but spelled differently (“break”, pronounced as “brek”), hence the confusion. Ain’t the English language fun? That is correct but is it based on a convertible or cabriolet – the Jeepster? That was not a commercial vehicle nor a truck but rather a private pleasure vehicle. There was a pick up version too. There was no saloon or sedan version of the vehicle. I think it’s the other way around — the Jeepster came two years after the Station Wagon. The Station Wagon is pretty far removed from the standard Jeep (itself a military vehicle, of course). I doubt a single body panel was shared between the two, which pretty much makes the Station Wagon a completely new car in its own right. 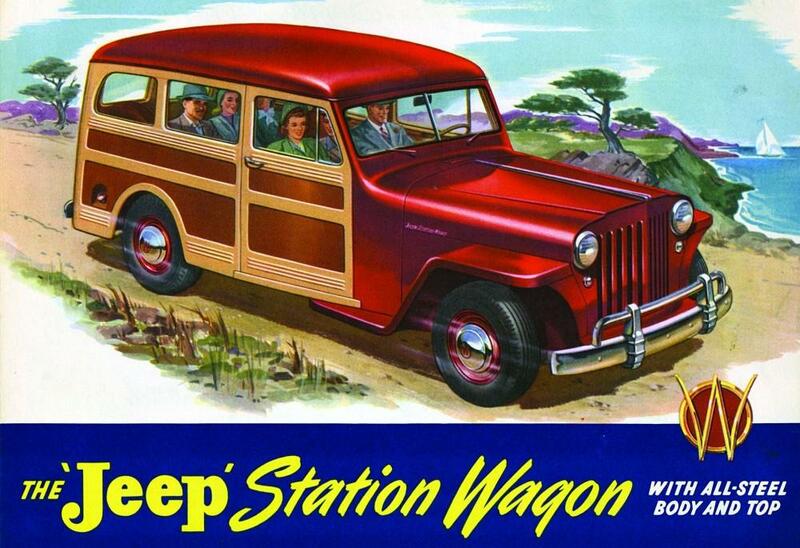 You’re right; the Jeepster was preceded by the Station Wagon. I guessed the other way around and was wrong. It does look like that the front clip was shared. The cars had the same wheelbase and running gear. My aunt had a Jeepster in the late ’50s; she used it as the grocery getter/beach cruiser in her Encinitas, California neighborhood. The frame of the Willys Wagon is not the same as the truck. The wagon had the same track front and rear, whereas the truck has a wider rear than the front end. That attribute makes tacking the truck onto a modern frame a much harder proposition than with the wagon. One of those great posts where almost every car is both rare (to my eyes anyway) and interesting. I especially like the Dauphinoise ‘break’, with it’s 2CV-ish front end and Morris Minor-ish rear – a beautiful, practical-looking small car. The small Peugeot 202 is also an attractive package, and the larger 402 with its sensibly curved lower tailgate looks like it could contain almost any amount of cargo. A wonderful article with ditto pictures, Tatra. Thanks! Yet again an insane cavalcade of obscure carbodies from T87. What a pleasure to read such an article. I disagree on the distinction between car and truck chassis, steel or wood bodies. One should not forget that the name station wagon was initially applied to horse or mule driven vehicles, so not very different from trucks or buses. Ditto for the shooting brake and the “break de chasse”. In Brazil these models were called “perua” (she-turkey) because the first wood bodies, usually hand built on a truck frame, looked as oddball as the bird itself. The Peugeot 202 woody has particularly nice lines, especially that curve of the wood at the front door. Great article, Tatra, Thanks! Learned a great deal about cars of which I had little or no knowledge. Please keep these well-researched, informative features coming! such beautiful european vehicles ! . too bad we yanks didn’t get them .